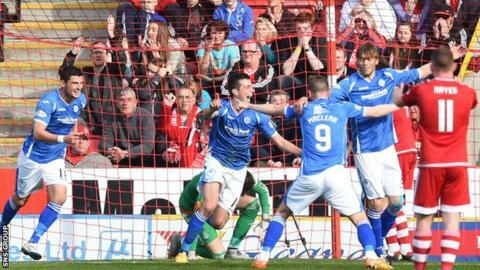 St Johnstone stunned Premiership leaders Aberdeen with a clinical display at Pittodrie. Brian Easton looped in an impressive volley and Joe Shaughnessy knocked home the visitors' second after 10 minutes. Ash Taylor pulled one back immediately with a header but Dons keeper Danny Ward let a Liam Craig shot creep past him before half-time. Steven MacLean then added two close-range headers as Saints picked up their first away points of the season. Aberdeen remain four points clear of Celtic at the top of the table, although the champions can reduce that lead when they visit Hamilton on Sunday. On this form, the Dons are a long way from a title challenge. Having opened with eight consecutive league wins, the hosts have now slipped to back-to-back defeats. Easton opened his account for the season with a magnificent volley from the edge of the penalty area that dipped under Ward's crossbar. It was a stunning, controlled piece of brilliance by the left-back and his manager Tommy Wright and assistant Callum Davidson celebrated wildly on the touchline. The visitors doubled their lead when Simon Lappin's free kick was headed towards goal by MacLean. The post briefly saved Ward but Shaughnessy was on hand to prod home the rebound against his former employers. Taylor reduced the deficit less than two minutes later, the big defender powering a Niall McGinn corner into the net to stem the flow after Zander Clark needlessly conceded the set-piece. Aberdeen began to control proceedings as they piled the pressure on Saints but, with the storm weathered, the two-goal lead was restored. Craig drew a wonderful save out of Ward at the expense of a corner, from which a weak Craig effort from the edge of the box squirmed beyond the on-loan Liverpool keeper. Saints evoked memories of one of their most famous of victories, when they scored five against Aberdeen in 1990, adding two more goals early in the second half. MacLean twice headed past Ward, firstly at the near post from a Craig corner and then at the back post from a Graeme Cummins delivery. That signalled an exodus of hundreds of Aberdeen supporters from the ground, although Adam Rooney, McGinn and David Goodwillie went close to lessening the embarrassment. MacLean then thought he had completed his hat-trick when a shot was almost spilled into his own net by Ward. 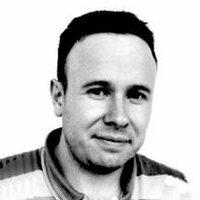 Having conceded only three goals in their first eight domestic games this season, Aberdeen have let nine past them in their last three. And Derek McInnes will have the international break to reflect on his worst defeat as Dons manager. Match ends, Aberdeen 1, St. Johnstone 5. Second Half ends, Aberdeen 1, St. Johnstone 5. Corner, St. Johnstone. Conceded by Barry Robson. Substitution, St. Johnstone. Greg Hurst replaces Steven MacLean. Simon Lappin (St. Johnstone) is shown the yellow card. Corner, Aberdeen. Conceded by David Mackay. Substitution, St. Johnstone. Darnell Fisher replaces David Wotherspoon. Foul by Scott Wright (Aberdeen). Substitution, Aberdeen. Scott Wright replaces Jonny Hayes. Corner, Aberdeen. Conceded by Brian Easton. Corner, Aberdeen. Conceded by David Wotherspoon. Goal! Aberdeen 1, St. Johnstone 5. Steven MacLean (St. Johnstone) header from very close range to the high centre of the goal. Assisted by Graham Cummins. Substitution, Aberdeen. David Goodwillie replaces Peter Pawlett. Goal! Aberdeen 1, St. Johnstone 4. Steven MacLean (St. Johnstone) header from the centre of the box to the bottom left corner following a corner. Corner, St. Johnstone. Conceded by Jonny Hayes. Second Half begins Aberdeen 1, St. Johnstone 3.